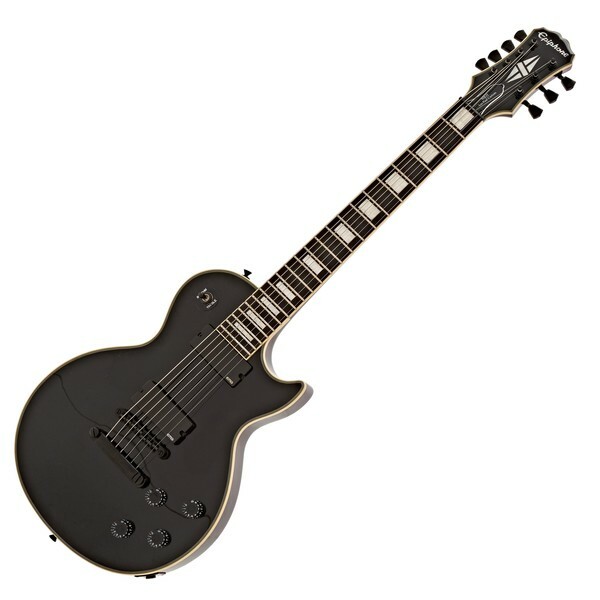 The Epiphone Matt Heafy Les Paul Custom 7-String Electric Guitar enhances the signature Les Paul with the addition of an extra string, expanding its sonic range and providing players with extra tonal possibilities. Designed in collaboration between Trivium's Matt Heafy and Epiphone, the classic Les Paul is crafted from a mahogany body and neck to deliver beautifully warm, soft tones. An ebony fingerboard is also added to enhance the guitar with a fast attack and a striking high end, while the 1960's slimtaper D profile offers an incredibly comfortable playing experience. 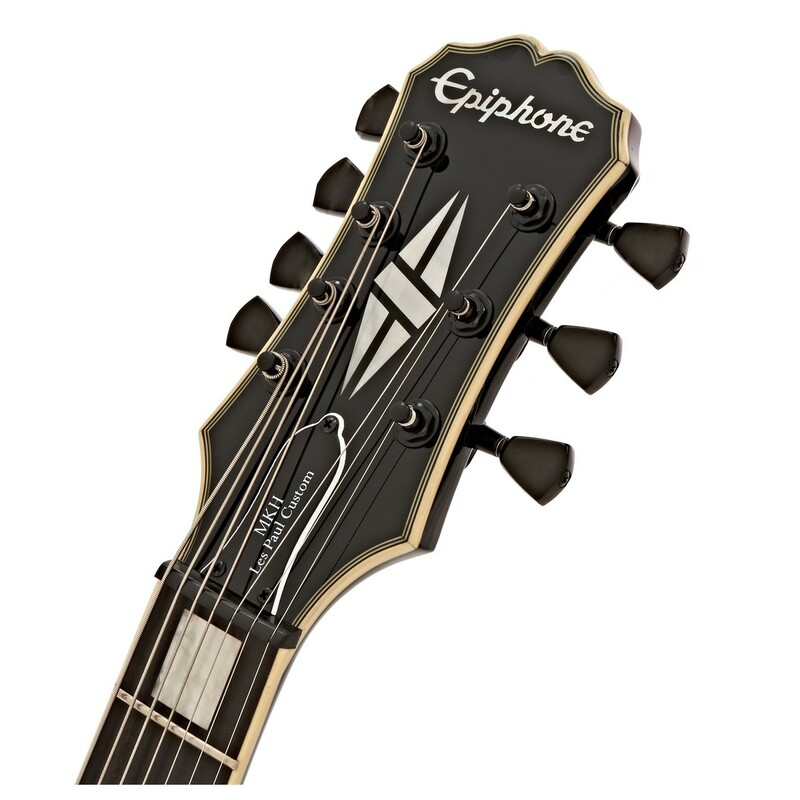 The Epiphone guitar is equipped with a set of EMG humbuckers, delivering versatile tones with plenty of destructive power to accommodate even the harshest playing styles. 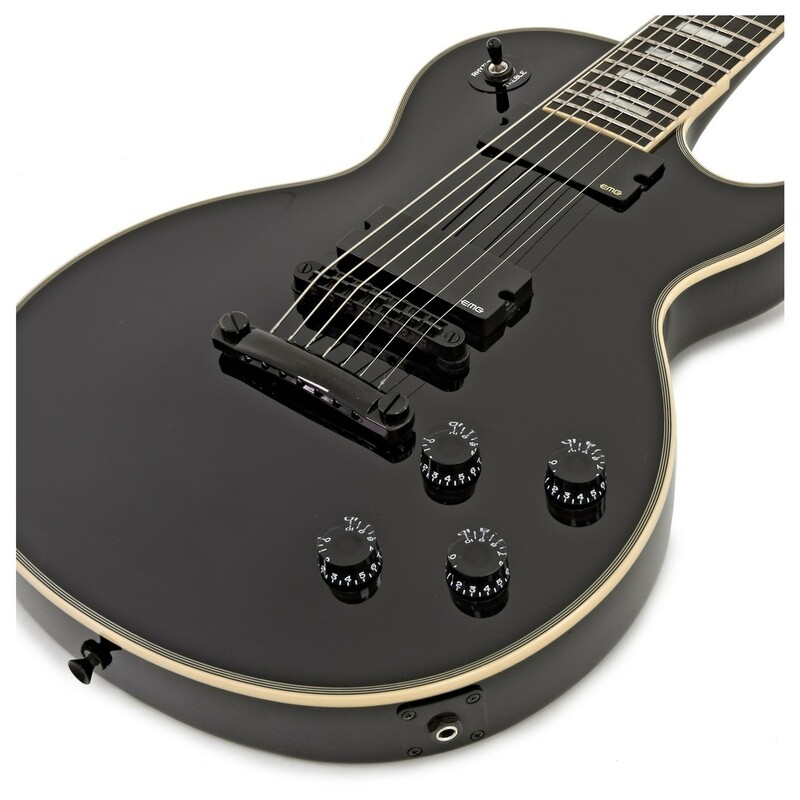 Reflecting Matt Heafy's distinct approach to the guitar, the Signature Les Paul Custom is the perfect choice for both fans and heavy metal enthusiast. Crafted from sturdy mahogany topped with plain maple veneer, the guitar delivers a beautifully warm tone with plenty of resonance ideal for searing leads and powerful licks. Mahogany is known for its pleasant characteristics, offering players balanced tones with excellent grind and bite to cut through dense mixes. The classic Les Paul shape embodies the essence of the original ones created by Les Paul himself, offering a truly iconic design enhanced by the high-quality craftsmanship of Epiphone. The smooth mahogany neck is designed with a classic 1960s SlimTaper neck profile, featuring a comfortable ‘’D’’ shape to provide an enhanced playing experience. Originally introduced and made famous by many 1960s era, Kalamazoo-made, Gibson and Epiphone guitars, the profile is designed with the perfect thickness for a stable neck and a comfortably, speedy performance. The neck is coupled with an ebony fingerboard, adding an incredibly fast attack with muscular lows, snappy highs, and enhanced the mahogany with extra warmth and openness. For the 7-string version of Matt’s signature Les Paul, the EMG 81 pickup is coupled with their 707 humbucker, eliminating the common problem of a muddy low B string that lacks rich harmonic character. Manufactured with an alnico V magnet and wide aperture coils, the EMG 707 offers an enhanced low B string, whilst still delivering a balanced tone. The EMG 81 is placed at the bridge position and features ceramic magnets, delivering detailed intensity with plenty of high end cut and sustain. Tune-O-Matic bridges are an extremely popular fixed bridge type due to their stability, reliability, comfortable playing position, and impressive sustain. 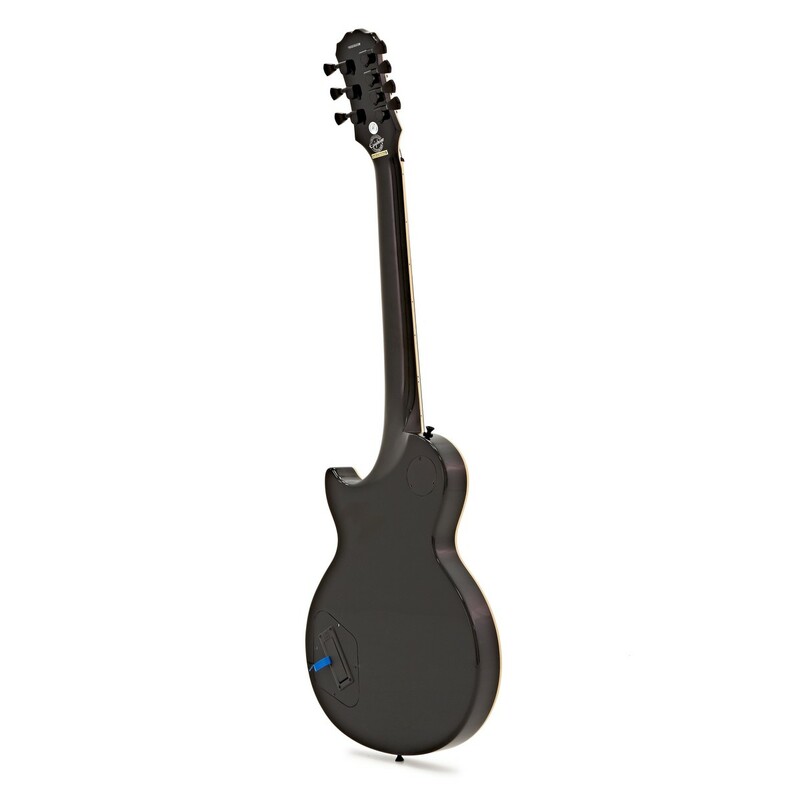 A specialised version of the tune-o-matic bridge is used for the Signature Les Paul, specifically designed to accommodate its 7-string setup. This bridge also automatically locks the tune-o-matic and the stopbar onto their posts, improving string security and enhancing the overall sustain. Matthew "Matt" Kiichi Heafy is a Japanese American musician, best known for his work as lead guitarist and singer of the heavy metal band trivium. Born 1986 in Japan, Matt only lived there for a year before moving to Florida and started to learn the saxophone before taking up the guitar. At aged 12, Matt was asked to join trivium after performing on guitar at his school’s talent show and soon after became their lead guitarist and singer. In 2006, matt won Metal Hammer’s ‘’Gold God’’ award, and currently Trivium have sold over 1 million albums worldwide.